With the onset of the Great Depression, Lange turned her camera lens from the studio to the street. Her studies of unemployed and homeless people, starting with “White Angel Breadline” which depicted a lone man turned away from the crowd in front of a soup kitchen run by a widow known as the White Angel, captured the attention of local photographers and led to her employment with the federal Resettlement Administration (RA), later called the Farm Security Administration (FSA). 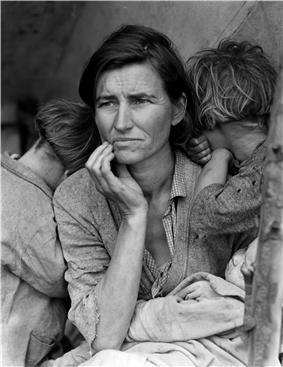 Lange's best-known picture is titled "Migrant Mother." The woman in the photo is Florence Owens Thompson. The original photo featured Florence's thumb and index finger on the tent pole, but the image was later retouched to hide Florence's thumb. Her index finger was left untouched (lower right in photo). In 1941, Lange was awarded a Guggenheim Fellowship for achievement in photography. After the attack on Pearl Harbor, she gave up the prestigious award to record the forced evacuation of Japanese Americans from the West Coast, on assignment for the War Relocation Authority (WRA). She covered the internment of Japanese Americans and their subsequent incarceration, traveling throughout urban and rural California to photograph families preparing to leave, visiting several temporary assembly centers as they opened, and eventually highlighting Manzanar, the first of the permanent internment camps. Much of her work focused on the waiting and uncertainty involved the removal: piles of luggage waiting to be sorted, families wearing identification tags and waiting for transport. 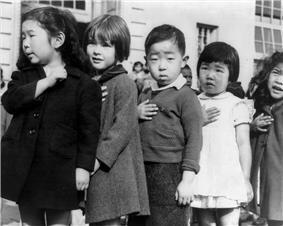 To many observers, her photograph of Japanese American children pledging allegiance to the flag shortly before they were sent to camp is a haunting reminder of this policy of detaining people without charging them of any crime or affording them any appeal. On August 29, 2014, American Masters – Dorothea Lange: Grab a Hunk of Lightning premièred on the Public Broadcasting Service (PBS) network. Directed and narrated from a unique perspective by Lange's granddaughter, Peabody- and five-time Emmy award-winning cinematographer Dyanna Taylor, the film combines family memories and journals with never-before-seen photos and film footage as well as newly discovered interviews. A companion book, Dorothea Lange: Grab a Hunk of Lightning, by Elizabeth Partridge, was published in 2013 and is the only career-spanning monograph of Lange's work in print. ^ "Corrina Wu, "American Eyewitness", ''CR Magazine'', Spring/Summer 2010". Crmagazine.org. Retrieved 2012-09-14. ^ Durden, Mark. Dorothea Lange (55). London N1 9PA: Phaidon Press Limited. p. 126. ^ a b c Oliver, Susan (2003-12-07). "Dorothea Lange: Photographer of the People". ^ a b c "Dorothea Lange ~ Watch Full Film: Dorothea Lange: Grab a Hunk of Lightning". American Masters. PBS. August 30, 2014. Retrieved September 10, 2015. ^ Dunne, Geoffrey (2002). "Photographic license". ^ "Hayward, California, Two Children of the Mochida Family who, with Their Parents, Are Awaiting Evacuation". ^ Civil Control Station, Registration for evacuation and processing. San Francisco, April 1942. War Relocation Authority, Photo By Dorothea Lange,From the National Archive and Records Administration taken for the War Relocation Authority courtesy of the Bancroft Library, U.C. Berkeley, California. Published in Image and Imagination, Encounters with the Photography of Dorothea Lange, Edited by Ben Clarke, Freedom Voices, San Francisco, 1997. ^ Alinder, Jasmine. "Dorothea Lange". Densho Encyclopedia. Retrieved 28 August 2014. ^ Robert Mix. "Vernacular Language North. SF Bay Area Timeline. ''Modernism (1930–1960)''". Verlang.com. Retrieved 2012-09-14. ^ BellaVistaRanch.net. Suisun History. Nancy Dingler, .Part 3 – Fifty years since the birth of the Monticello Dam Retrieved on August 17, 2009. ^ Partridge, Elizabeth (1994). 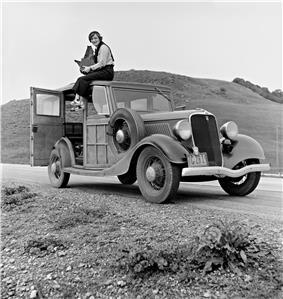 Dorothea Lange–a visual life. Washington and London: Smithsonian Institution Press. p. 26. 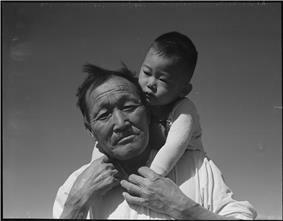 ^ Dorothea Lange, letter, January 16, 1953, quoted in Szarkowski, “The Family of Man,” 24. 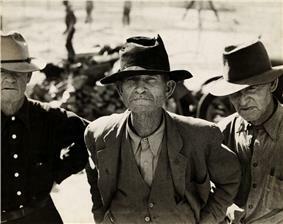 ^ "Dorothea Lange Is Dead at 70. Chronicled Dust Bowl Woes. Photographer for 50 Years Took Notable Pictures of 'Oakies' Exodus.". New York Times. October 14, 1965. Retrieved 2008-06-29. ^ "Trailer: Dorothea Lange: Grab a Hunk of Lightning". http://lacrossehistory.org/literature/cached/DorotheaLange.pdf David Joseph Marcou's Oct. 2009 article with endnotes 'Migrant Mother, Florence Thompson' and the 'Nisei Internees'.